Bio : Any facts I have about this artist are derived from her web page. 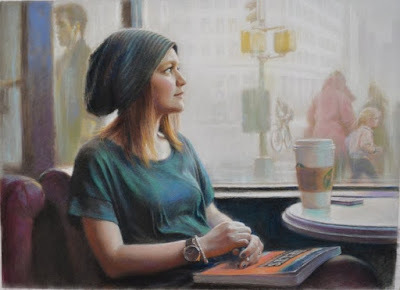 Living in New York City, Nan Ping Yun specializes in drawing portraits and figures in classically realistic style, inspired as she is by the cultural diversity of the city. She loves to draw quick sketches of people; in the moment when a person whose extraordinary appearance or temperament instantly captures her attention, her mind is quickly infused with this impression and wants to keep this impression. For Nan Ping, each of these moments is fascinating which inspires her to sketch and then permanently preserve this impression in the painting. The artists states: Three passions, simple but overwhelimingly strong, have governed my art: the longing for beauty, the search for truth, and unbearable pity for the suffering of mankind. I choose to paint realistically because I believe realism is truth and truth is beauty.For me, the creation of every piece of my paintings is an aesthetic pilgrimage during which I am fully dedicated in every step of this long process. Gallery: A series of thumbnails with one enlargement at a time on the same page. Image View: Thumbnails enlarge in a window on the gallery page. Gazing is 22 x 30 inches; Pastel Society of Tampa Bay Award, 2015 Enduring Brilliance Exhibition, Pastel Society of America. Blog/Facebook : Not that I can see.